And the moment we've all been waiting for has arrived. 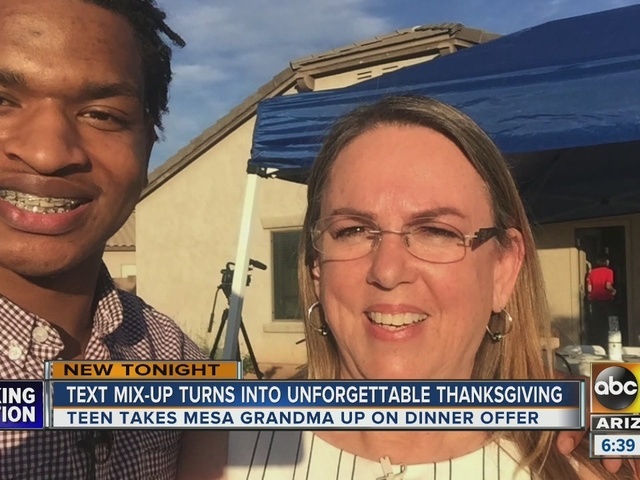 Remember the Valley grandma who accidentally invited a stranger to Thanksgiving dinner? Wanda Dench thought she was texting her grandson and his girlfriend inviting them over to her home this year for a plate of turkey, mashed potatoes, stuffing and of course, pie. The only problem was that she was actually texting Jamal Hinton, who is not her biological grandson. But after the texting mishap, he's now her "honorary grandson." Hinton told Dench she was texting the wrong person, but figured he'd ask her if the offer for Thanksgiving dinner still stood. She said it did because "that's what grandmas do....feed everyone." And on Thanksgiving, a day people spend with their family members, Dench invited Hinton into her home. With guests arriving at her home, Dench waited in anticipation for Hinton. When he arrived, a handshake quickly turned into a hug. A Thanksgiving table grew by an extra plate, as the grandma embraced the accidental, but loving, modern mistake of texting the wrong person. "I'd never seen her before and she welcomed me into her home," Hinton said. "That shows me how great of a person she is, I'm thankful for people like that." Dench, who's gotten a lightning fast lesson in the power of social media after this, said the positive response she's gotten in return from strangers is overwhelming and she believes there's a higher power at work. "This wasn't me, it's come from God above," she said. "He's just using us as his tools and vessels to bring a message to others." It's a lesson in kindness, and a blessing in disguise for these two who smile over a friendship that is sure to last a lifetime.